Including broccoli in your diet is a good way to add iron in your diet, and this Tomato Broccoli Soup is a great way of including it in your diet. 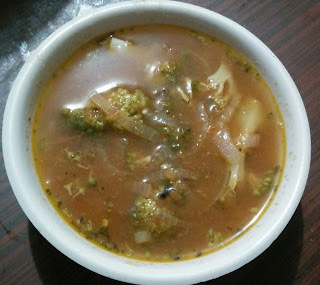 This delicious Tomato Broccoli Soup can be enjoyed hot during monsoons. In a soup pan add oil and saute garlic, once it starts browning add onion and fry till it turns golden brown. Now add broccoli and saute it for few minutes. Once broccoli is a bit cooked add tomato puree and maggi cube and mix well. Add 1 cup of vegetable broth and bring the soup to a boil. Garnish the tomato broccoli soup with dried herbs and pepper powder.